The European Commission launched a legal attack against Gazprom on Wedensday (22 April) , against the background of a major political crisis between the EU and Russia, over Ukraine. But Margarethe Vestager, the Commissioner for Competition, stayed factual, and refrained from making political comments. This is the beginning of a long procedure that may lead, in the worst case, to a fine of 10% of Gazprom’s total turnover. But an out-of-court settlement is also possible. As a first step, Gazprom has 12 months to react to the Statement of Objections. This may have enabled Gazprom to charge unfair prices in certain member states, up to 40% higher, in the case of the three Baltic countries, Poland and Bulgaria, Vestager said. In light of its investigation, the Commission’s preliminary view is that Gazprom is hindering competition in the gas supply markets in Bulgaria, the Czech Republic, Estonia, Hungary, Latvia, Lithuania, Poland and Slovakia. Of all the Central and East European countries, only Romania and Slovenia are not mentioned. Gazprom is also reproached for leveraging its dominant market position by making gas supplies to Bulgaria and Poland conditional on obtaining unrelated commitments from wholesalers concerning gas transport infrastructure. For example, gas supplies were made dependent on investments in the now-defunct South Stream pipeline project, or accepting Gazprom reinforcing its control over this infrastructure. In the case of Poland, the griefs are related to the Yamal pipeline. At the Commission’s midday press briefing, Vestager was pressed by journalists regarding the timing of the charge. Although the procedure against Gazprom was opened in August 2012, the announcement coincides with Russian-Greek talks over a gas pipeline, which irks EU regulators. 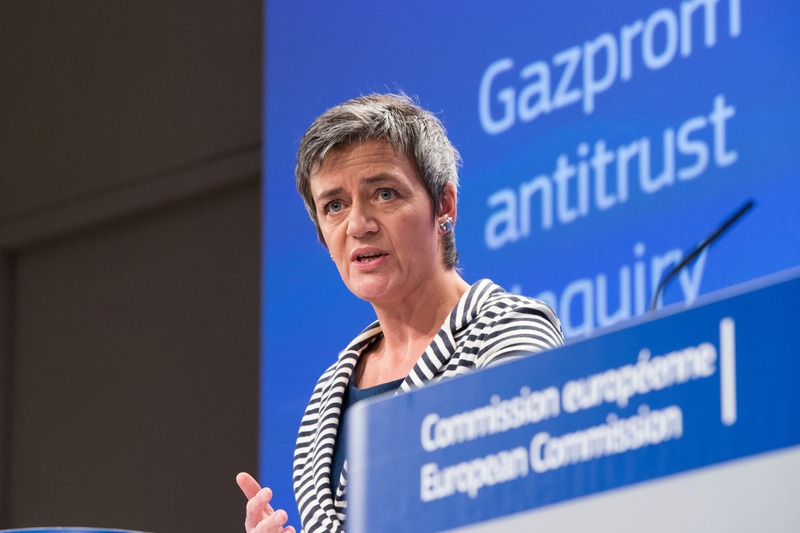 Vestager’s crackdown on Gazprom also shows a renewed sense of determination at the Commisison, which avoided the issue under the mandate of its previous President, José Manuel Barroso. The Danish Commissioner said she didn’t know the reasoning of her predecessors, explaining that the procedure was open, based on evidence collected and analysed by her services. “To me this case is not political,” she said, adding that she recognises that there would be political speculation about it. She downplayed the importance of the Gazprom procedure, because as she said there had been previous cases, and that there are ongoing cases, as well. She also reiterated that the procedure was launched well before the tensions with Ukraine over the Russia’s annexation of Crimea. Asked if the Commission was dealing with a company or with the Kremlin, as Gazprom is a state-owned company dubbed by the press a “foreign policy arm” of the Russian government, Vestager said that in Europe, there were companies in which the state was deeply engaged, referring to EDF in France, and Enel, in Italy. “It’s a state-owned company, but it’s also a company doing business in Europe, a very professional, very large company, doing good business in Europe,” adding that she had no other wish than that the company should abide by EU law. “From my point of view, this is a competition case. Because this is the way we have investigated and proceeded with the case. And as always tis is based on facts, on interpretations of facts and evidence that we have found,” she said. In the meantime, Gazprom rejected the antitrust charges. “Gazprom considers the objections put forward by the European Commission to be unfounded,” it said in a statement, insisting that its pricing and other policies were in line with legislation. Gazprom offered concessions to Vestager’s predecessor, Joaquin Almunia, last year, in a bid to settle the case and avoid a possible fine. But talks failed over its refusal to cut prices in Eastern Europe. Gazprom is the dominant gas supplier in a number of Central and Eastern European countries. It has a market share well above 50%, and in some cases, up to 100% in these markets. In light of its antitrust investigation, the Commission's preliminary view is that Gazprom is hindering competition in the gas supply markets in eight Central and Eastern European member states (Bulgaria, the Czech Republic, Estonia, Hungary, Latvia, Lithuania, Poland and Slovakia). Generally, Gazprom pegs the price of the natural gas it sells to a number of oil products ("oil indexation"). The Commission is investigating whether, and to what extent, the individual price levels in a country are unfair, and how Gazprom's specific price formulae based on oil indexation have contributed to the unfairness. Putin will wait until winter to respond.